Overview: What Is To Be Done ? The Introduction’s 4M framework (immediate previous post) helps us understand how a station can evolve and better connect to mobility’s ever-changing modes. Introducing the second ingredient, my photo of Grand Central Terminal during GCT’s 100th anniversary celebration should remind us that a station also succeeds — or fails — based on how its real estate evolves. As the archetypal 20th Century Marvel, GCT also is one of America’s most enduring real estate deals. But however the visitor numbers get worked, they are mere icing on GCT’s economic cake which has maintained the best property values compared to the world’s stations for all of the 20th Century. So well constructed was GCT’s deal that the station continues to stay in private hands… despite the mid-century demise of passenger rail which caused the economic failure of almost all stations nationwide. How can seeming perfection be improved ? Despite centering some of the most valuable real estate in Midtown, we note that GCT still will not be a Master in the sustainable era until it through-routes tracks connecting New York’s northern suburbs to Penn Station and across the Hudson. While only slightly more than a mile, such a tunnel is highly improbable; given the tri-state area’s antiquated transportation governance. Why government prevents the New York region from having this short tunnel is, at first, a mystery. Why do our governments bar regions from all the social and economic benefits of through-routing? While we should ask ourselves, we also should ask GCT’s owners. Their motives are the same as the ones that built the railroads that terminate there. GCT’s owners want trains to terminate there so passengers work in surrounding buildings. For if trains instead go through to buildings near Penn Station or even struggling Newark, then passengers can work there and those buildings become more valuable than GCT’s mini-city. Knowing the politically powerful, GCT’s owners have incentive to keep trains terminating there… despite all other global cities having through-stations. While GCT’s surroundings have lasting value, most American central stations are surrounded by freight yards that are being repurposed too slowly. Their owners (usually Amtrak or another public agency) lack incentive and skills to organize partners to repurpose a vestigial rail yard. So, these yards continue to drag down the station’s redevelopment and, thus, discourage train commuting; still the most efficient technology to move people within a region. While many early 20th Century stations were built as Marvels, most devolved into Mix-ups as autos became dominant and private rails failed. While some stations are transitioning now into a Makeover stage (Denver and LA Union stations are prime examples), this incurs unnecessary cost to the public because we labor under agencies that lack incentive or authority to solve the challenges ahead. Central stations surrounded by rail-yards are among America’s least exploited redevelopment opportunities. The largest is in my hometown. Chicago’s Union Station (CUS) has a large railyard (also owned by Amtrak) that should become an obvious extension of the Central Business District. Not discussed is a related opportunity for redeveloping the region. Updating CUS and its rail-yard could start through-routing nine of Chicagoland’s twelve radial lines; all concentrated in that three mile central corridor. But, shaping this 21st Century network requires creating an advocate. This is sketched in the Chicago chapter. Through-routes are the key Big Picture strategy for trains and, more important, transportation’s role in urban redevelopment. This website accepts the growing evidence that America’s dependence on the automobile now hurts a household’s ability to grow net wealth. Agencies perpetuate this subtraction. So, this Overview and this website asks those in authority to know this: until transportation governance evolves and rebalances cars and their alternatives, the economic benefits of through-routing will not be available to Americans. Without proper through-stations, household transportation costs will continue to grow faster than inflation and metropolitan redevelopment will be hampered and real estate values (and property taxes) around stations will be suppressed. If any phase of any official plan does not take strategic steps to through-route any station analyzed by this website, then tax dollars will not be invested as well as they should be. This is primarily so because a through-station has a multiplier effect to increase passengers for all the other modes that converge. Better yet, a central through-station helps improve land values surrounding every station in the through-network. Compare this with 20th century terminals with their relatively weaker multiplier on real estate because terminals at capacity now limit transit growth. So the broader policy question before us is this: How do private sector capital and public authority get re-aligned to invest in through-stations that improve all modes so they, in turn, accelerate the redevelopment of surrounds and regional centers ? To answer this, let’s view America as having a dysfunctional family of modes that, to be productive, must be put together in-sync. This then poses the colloquial question: Who is the Daddy? Who is in charge? Who gives taxpayers value? The final chapter of these twelve (see Table of Contents in right column) details those answers. American metros need a new deal for transportation. The under-funded and under-authorized caretakers of bankrupt assets have been neglected by state DOTs whose primary business is roads. So, who will help every metro explore a new regimen of Public Private Partnerships so that they might serve the emerging greater goods of environmental balance, economic growth and fiscal sustainability ? Fortunately, this triple bottom-line can be partially achieved if encouraged by new federal guidelines. Yet, each metro also requires its particular deal to develop their specific through-routing multiplier. This two-level, national-metro authority re-alignment has occurred generally in most of Europe’s global cities and helps explain why they entered the era for more sustainable transportation so far ahead of America’s global cities. Why So Many Summaries ? Repetition and reiteration. The goal of “What Stations Teach” is to fashion national guidelines that support many large metros. The reasons are clear: each region cannot reinvent the wheel; nor is Uncle Sam helpful if regions are forced outside their political comfort zone. So, reiteration is this website’s job: analyze, synthesize solutions, critique them and do it again…. until we get it right. Here are the initial summaries “WST” uses as steps in this iterative process. Second, The 4Ms Introduction sets a framework for evolving stations so they better center commuter rail. The Overview you just read suggests a context in which successful updates maximize land values only if they master regional politics. Third step and released October 12, there will be working summaries of the forthcoming twelve chapters. Most chapters have a pretty good draft; thus allowing us to weave together trends and share solutions nationwide. And if all that is not enough to get commuter rail on track in the U.S., then we start drawing detailed lessons from the global cities of Europe sometime in 2019. To prepare for the October 12 posting of working summaries for each chapter, let’s briefly preview the Table of Contents on the right. Starting with the positives, we view Philly as a legacy exemplar and America’s only through-route. Two more chapters analyze how governance innovations add to transit growth in mid-sized metros of the Twin Cities and Denver. Then, we get a glimpse into the future by proposing how further devolving of state authority can help the San Francisco Bay Area and LA County work through their obstacles to improving train service. California’s success should give ideas to other multi-metro states such as Florida, Texas and, hopefully, Ohio. Then, three chapters address the systemic problems that require a federal policy to govern properly shared-state train corridors within metros. “WST” offers innovative proposals to govern train service for the DC region, Baltimore and the tri-state New York metro. All require their regions to reorganize authority with the aid and leverage of Uncle Sam. Synthesizing all the above chapter highlights, the October 12th post lastly sketches Uncle Sam’s role in re-aligning private capital, state authority and public investment to facilitate each metro’s deal so each sticks longterm and, thereby, helps each metro prosper. It will not be easy to adapt federalism to transportation’s new era. But, American cities have no choice. Other global centers have advanced train technology and converted terminals to through-networks. We have lost what America mastered in the first half of the 20th Century when it became great. Fortunately, we are closer than we might think to catching our global competitors. But, that starts with learning from our mistakes and preventing them. Let’s start that on October 12, 2017. Author Charlie ComstockPosted on September 17, 2017 June 21, 2018 Categories federal transit policyLeave a comment on Overview: What Is To Be Done ? A Manhattan Marvel, Penn Station just before the long good-bye. Central stations are storehouses for a nation’s great moments. Stations also say much about the quality of our daily civic life. Unique as a building-type, stations make a wide range of civic statements that go beyond merely the quality and efficiency of how we transport people. Stations also played a role as key infrastructure. The same companies that built stations also built nearby freight depots. Those companies trains took raw resources scattered across a vast continent and integrated them into an economic powerhouse. Stations supported key transfer points that reshaped industries and built them into history’s dominant economy. Using the same corridors in the mid-20th Century, trains initially contributed to the sprawling of metropolises. But as train service declined, the central stations that served suburbanites’ daily train commutes fell into disuse. Except for New York’s Grand Central, stations were rarely updated well. Station decline ended early in the 21st Century as they again became a focus of civic energy; usually driven by the mayor. But, progress is frustrated. Eight of the ten largest U.S. regional train operators are fumbling to update their central stations. Most suffer decade-long delays due to lack of authority, ridiculous cost over-runs due to incompetence or corruption, inadequate funding due to short-term governance and the major strategic mistake of spending money without starting to convert terminals into centers for high-capacity through-networks; a process Europe’s global cities started five decades ago and have almost finished. Serving as pivot points to support how previous generations grew a continent into the world’s greatest industrial power, today’s central stations offer us a different opportunity to shape a new future, possibly a comprehensively sustainable one. Today’s civic focus on updating central stations implicitly tries to tap this opportunity. By understanding today’s frustrations and, specifically, how mobility modes should converge on the central station, fixing stations properly serves as a microcosm for how sustainable metropolitan transportation can emerge. Central stations are a micro-message of the macro-message articulated in “The Metropolitan Revolution”: cities serve as our key economic engines. Today’s central stations should welcome the information economy’s employees to their central business district. Station quality directly impacts how they get transported to other regional centers. Central stations help reshape sprawling metropolitan areas into more compact ones with fewer choke points. The above book from The Brookings Institution reinforces my generalized takeaway after studying stations intensely for several years: we must transfer the required transportation and taxing authorities from state government and refashion them to make mobility better for each metropolis. If a city can update well its central station and surrounds, it contributes a symbol to define its metropolitan revolution because transportation is one of the most obvious regional services. As transportation gets rebalanced at the metro level, the region will control a key asset for redeveloping their land and tax base for the sustainable era. Trains and their stations are a primary theatre for cities and their suburbs to collaborate better. Station updates can accelerate your city’s transformation from automobile dominance to a more fiscally-balanced and economy-supportive mix of modes. But before this writing project describes how each of these stations can help achieve those benefits, let me state the project’s chief conclusion: we ultimately must govern transportation better and use trains as a coordinated tool to redevelop cities and suburban centers. I just packed a lot into one civic building… and a writing project. But this challenge of rebuilding stations — the places were journeys begin — will play an important role in stimulating America’s psyche of opportunity to redevelop cities for the new era. The first stage of this inquiry into central stations revealed too many clues that transportation is governed poorly. These clues bop around in the eight articles I posted through 2014 on “The Urbanophile.” (Thanks to Aaron Renn, you can still link to the series; since it made the cut when he winnowed his blog’s archives.) This series tested the emergent policy abstraction called “sustainability” by applying it to central stations. That link shows how I categorized stations according to four steps toward sustainability. In analyzing these stations that center America’s major commuter lines, the obstacle to improving stations was transportation’s authority was too weak and outdated agencies were flailing and failing us. Failure’s most obvious evidence is the repeating attempts to update two of our three most important stations, Manhattan’s Penn and Chicago’s Union. Not only do these two hell-holes dehumanize travel for employees in the nation’s two most important commercial centers, but agency efforts always postpone the obvious need to through-route. Through-stations are already the 21st Century standard. Through-routing improves the efficiency of transit and, consequently, redevelopment more than any single public investment. Yet those benefits are blocked by the agencies that control central stations. In transportation’s Big Picture, today’s caricature of governance will continue haunting us with dysfunction and debt. To reshape government (a Herculean challenge), we need a symbol signaling that change is possible. This project proposes updating stations as a first step in making metropolitan transportation networks in which services mesh. Because station updates are usually made more difficult by either a lack of authority or it being in the wrong agencies, stations at least serve as our target that illustrates the Big Picture. Most of North America’s 29 metropolises operating commuter rails have made some effort to update their stations. The few that have updated their stations well usually have innovated their governance and, often, have earned sufficient taxpayer support. So the correlation between correct updates and reform seems strong. But this inquiry’s findings are that most large American cities cannot overcome antiquated transit agencies… unless taxpayers fund and monitor an agency of change. Upon recognizing my project must deal more forthrightly with political obstacles, the postings stopped during 2015 while I thought through a more likely strategy. Responding to America’s reality, this project’s next stage (this website) will propose sweeping changes in transportation’s governance and funding. This also requires a new deal for commuters and taxpayers who must invest in stations that center transit in the emerging metropolitan regime. This website proposes a new synthesis after its analysis of what works and what does not. Let’s start with the good stuff: when we knew how to build great, functional civic spaces. Author’s photo during her 100th birth year of the Grand Dame and workhorse, 2013. How Marvels Work. The main concourse of Grand Central Terminal (above) set a high, majestic standard for the many other cities who built — and aspire to build — beautiful stations that say “Welcome.” One source boasts that GCT has over 22 million visitors a year; making it one of the most visited attractions in the world. Many come to gaze into the ceiling’s constellations; as if to marvel at the awe of Creation. Back on our planet, remember that GCT was a real estate deal. It still is; which largely explains why it continues to succeed. This Marvel also sets a standard for how terminals function. A Marvel of how engineering and human behavior mix, GCT also is huge. It has 67 tracks with wide platforms that handle packed trains well on two underground levels. GCT then gives passengers many options to flow efficiently (and gracefully by New York standards) into six subway lines or rise to the main concourse and its constellation; inspiring travelers to gird Midtown’s streets and arrive at their final destinations. While none are as large or majestic as GCT, other central stations work like Marvels. Philadelphia’s three Center City stations connect via through-route (a key Master ingredient.) That same reason can help a mid-sized station in a struggling town, Newark’s Penn Station, punch well above its weight. These American Marvels were built in the 20th Century’s first three decades, supported by the profits of real estate deals. A more common collaboration were deals worked out between competing rail companies. Called “union stations,” they usually consolidated passenger terminals next to rail yards shared with freight at the edge of the central business district. Messier than the quality Marvels above, Union Stations still collectively shaped the public purpose of making centers that enhanced mobility. But, the glory decades faded fast. The second half of the Century saw rails and their deals decline as the auto and airplane captivated America’s mind, decentralized mobility, and sucked in huge taxpayer subsidies that de-stabilized transportation in ways that we do not seem to know how to correct today… even where rails made towns such as Chicago. Reflecting consensus, this photo from Chicago’s 2012 “Master Plan for Union Station” shows how workers and taxpayers feel squeezed in the concourse. Not fixed in the 1991 renovation, today’s attempts again are frustrated by disjointed governance. Why Mix-ups Matter. My city’s largest central station takes commuters doing the right thing and punishes them by squeezing them through a hell-hole. I call it “the CUS-ed Experience.” It starts when de-boarding into a 90 year old trainshed with ridiculously uneven pavement, narrow platforms, ongoing complaints of diesel exhaust and the increasingly frequent surprise of concrete falling from the shed’s roof. The photo above continues the CUS experience in the passage from the concourse out to the street where the confused melee continues, crosses congested bridges and does not calm for usually a few blocks. Overall, the CUS experience reflects an inability for agencies to work together and, basically, respect passengers and taxpayers. In 1991 when CUS’ had a fast-growing commuter service and Illinois had money, this peak congestion might have been solved if an agency-in-charge understood the cramped concourse was because a skyscraper squished the concourse. (This created the Mix-up.) But instead of proper authority doing the right thing, political expediency insisted on pouring substantial renovation money into a rat-hole that, 25 years later, is a busier rat-hole. This poster child for dysfunction in transportation’s governance is owned by Amtrak. CUS’ owner has only 10% of CUS’ daily passengers. The 90% commuters are Metra passengers; an agency supposedly supervised by Illinois but, de facto, has its authority decentralized by the region’s 240+ suburbs. This weakens the agency so much that it cannot contribute to correcting CUS, where six of Metra’s eleven lines terminate. With the powers-that-be unmoved, the agency with the least authority and money now leads a new renovation. Chicago’s Department of Transportation has conducted plans for two decades; but, its good intentions lack funding and undermines its leadership. One key difference between Marvels and Mix-ups appears in the “Connections” sheet of each station’s scorecard that you can find towards the beginning of each “Urbanophile” article. Mix-ups result from poor cooperation between agencies and providers. GCT, our 100 year old Marvel of efficiency, has subways on all four sides. CUS, our Mixed-up poster child, has the nearest stop of the Chicago Transit Authority three blocks away. (New Yorkers, it’s Ok to laugh.) But know that this hyper-dysfunction results from weak and/or misplaced authority… and those problems are reported in a dozen station’s scorecards. Indicative of a nationwide flaw, consider further Mix-up examples. — For the inexcusable dysfunction between wealthy states, look no further than Manhattan’s Penn Station that serves some of the nation’s highest property values and centers America’s other major transit hell-hole. — For quintessential dysfunction within one of our most competent states, Boston’s north and south central stations remain disconnected because Massachusetts has a debilitating fear of tunneling; institutionalized by the disastrous Big Dig for cars. — And then, consider Maryland. Despite having probably the best state DOT, Baltimore’s central station does not serve the downtown. Curiously, the only serious proposal to correct this comes from a private venture seeking to build a high speed line from Baltimore’s downtown to the nation’s capital. Detailed in forthcoming chapters, Mix-ups support the conclusion that even competent state DOTs are bad fits for metropolitan station solutions; primarily because they need real estate deals intent on building mixed-use centers and enhancing mobility, something road-building agencies have too few skills for. “The Urbanophile” articles and scorecards analyzing stations help expose transit Mix-ups. They, most often, are caused because agencies lack the authority and/or motivation to coordinate all the players. Without a Daddy, agency sibling rivalries prevail and passengers — and taxpayers — get worse service than they paid for. Bottomline: With no agency enforcing operational efficiency, they lose taxpayers’ trust and thus lose the critical source of capital to upgrade stations and transit. Separated from station-building success by a century devoted to autos, cities with large suburban train systems have failed to prepare their stations to center metropolitan transportation. Worse, probably none will… if we depend on current agencies. Compare today’s failures to history’s most economically dominant nation in which 114 union stations were built by the collaboration between private inter-city rails in the first three decades of the 20th Century. Back then, train commuting was small and inter-city passenger rail had marginal profitability. Yet private companies — most of whom were big players in real estate — made great stations. Let’s admire one of the last major station’s built using that economic model and interpret it for the nation’s potential today. My blurry photo coveys how the exquisite waiting room of LA’s Union Station represents the unclear transition from Hollywood’s glorification of the auto as part of the American Dream to LAUS serving as symbol of the challenges facing the nascent Transit Metropolis. What Separates Mix-ups From Make-Overs? Answer: Taxpayer Trust… And Capital. While Mix-ups teach us that we should reorganize the business of moving people, Make-overs, at least, have a better chance of eventually centering improved transportation. This site’s Overview “What Is To Be Done” reinforces this. It is still too early to judge how LAUS serves as a center for LA’s transit Renaissance. Yet, this station made such a clear civic statement in the 1930s about LA’s intent to become a great city that LAUS was never allowed to slip into the Mix-up category… or be demolished as so many stations were. Still, LAUS has challenges. In the LA chapter, I explain why plans for LAUS are likely to produce a good Make-over and offers a hopeful example to most emerging Sunbelt commuter systems. The owner of LAUS, The Los Angeles County Metropolitan Transit Authority (branded as Metro), is the dominant transit agency for 10 million people. While California law enables counties with more authority, Metro’s true power derives from how it is building a new social contract for transit. We see this particularly in 2016 when it positioned itself to win 67% on the November ballot; required to renew the one cent sales tax passed almost 25 years ago and increased by another 1/2 cent now. As an example of its sophisticated marketing and steady positioning, view any of Metro’s press conferences or videos and you will see a steady stream of politicians and Metro appointees essentially, say: “You gave us money and we delivered a new transit line.” Compare this to how Chicago’s politicians lost credibility decades ago and New York’s ridiculous cost-overruns dampen claims to serve the public. But in LA, the political theatre works much better; in part because it is sincere. However staged, sincerity shows in this mural installed as LA got its first sales tax that launched its transit Renaissance in the mid-1990s. This mural in LAUS’ East Portal connects bus passengers to the train track concourse, the light rail and subway stations, and, then, into the vintage Union Station; unifying transit systems. Beyond mere functionality, LAUS and its mural reinforces that Metro wants everyone to know their transit options matter. Bigger Picture still… stations and transit remind us of our social contract through the commonplace commute. The same train that helps a million dollar trader get home also helps the immigrant janitor get to work in a suburban office building; both are motivated by America’s myths. Of the ten largest U.S. metropolitan areas, LA might be advancing the fastest this notion of a new social contract for transportation. What Separates Make-Overs From Masters? 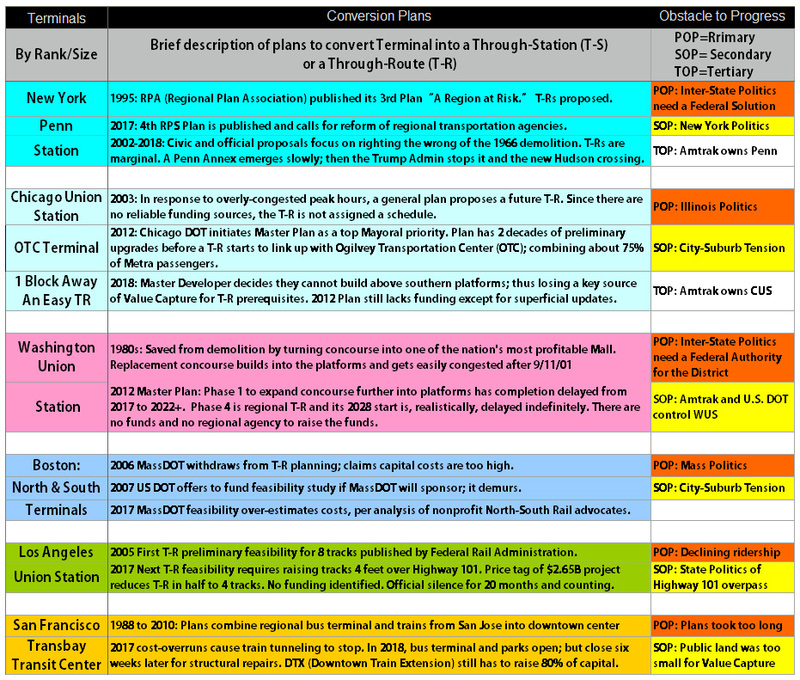 Revealing a worsening pattern of how station updates were unnecessarily expensive and/or ineffective by the agencies responsible, my series in “The Urbanophile” caused me to think through the project’s next steps. That same month, a think-tank and training institute for transit agencies, The Eno Center, published its study of six metro areas (above). Co-authored with The Transit Center, their pivotal study helped me see more clearly how stations could evolve. I soon formulated my 4Ms evolution for central stations. As governance improves, Mastery emerges which, in turn, earns more public trust which, in turn, yields enough of their capital to update systems for the Sustainable Century. Masters are not yet found in North America (although I am most hopeful of Toronto.) Routinely, Masters are found in Europe. In this project’s last phase, we will see what their stations teach us about preparing trains and their agencies for the future. Masters invest taxes so transit gives current and next generations the quality of life and economic benefits promised by taking those taxes. Europe enjoys that social contract. America does not; living in this moment, addicted to cars. If you look closely, stations reveal our deals are weak. Of America’s Make-over stations, most merely made-up for the neglect of previous decades. As a higher stage of evolution, Master stations perform functions well. They use through-routes to increase ridership and, thus, relieve subway and street congestion. Their agencies coordinate to redevelop central station surrounds more compactly… along with sub-regional stations along that through-route. Europe delivers a quality alternative to the car. This project’s final phase will try to keep foreign analogies tight to U.S. metros. I plan to start with a review of Toronto’s Union Station and the remarkable growth of GO Transit. Gleaning lessons, other chapters will review Paris, London, Germany, Italy and the Low Countries. Most their stations are Masters. Per capita passenger miles also tell the story: citizens in the 15 nations in the European Union use the train 10 times more than the U.S. To better understand how we narrow the gap, also planned is a chapter that labors under the working title of: “The EU Teaches Uncle Sam: Directives Work Better Than Interstate Compacts Or Federal Regulations.” This chapter reminds us that solutions are redeveloped sustainably at the metro level, but that accelerated change is facilitated at the federated level by sharing what works best. Where Do We Go From Here… And Who Will Care? The 20th Century routines for transport are re-balancing itself from the auto to more shared modes. Rails will continue to grow because they have superior efficiencies in moving people. Trains are the long-term link in the spectrum of how shared modes reduce transportation costs and road congestion. Whether or not we leave the next generation with masterful transit largely depends on how we evolve America’s 29 metropolitan train systems and what we teach one another about how transportation works sustainably. In visually concrete ways, stations are key to how trains sync with other modes. As for the political deal that convinces Americans to use their cars less… Well, that deal has odds better than they appear. Know that the U.S. metros reviewed in forthcoming chapters total over 61 million that can benefit from better central stations. For stations not analyzed, add another 29 million. Then add in 31 million more from the 24 regional rail wannabee metros who actively are planning or building a rail line. Total this up and some 121 million Americans have varying agreements about making trains into a regional service. This 38% of the nation will benefit if through-routed stations center trains whose purpose is to help redevelop metro areas. This constituency deserves more than aged stations. Central stations should center systems that leverage transit’s environmental, economic and fiscal benefits. When stations show such Mastery, they reinforce the social contract with America’s taxpayers that their investment was well spent today and tomorrow. We need to think through a deal good enough to breed ventures to solve challenges so our times are made great. For that, let’s first metaphorically give a clutching hug to the next generation. We owe it to them to improve the advantage that was passed on to us.